Did you ever wonder how a coach puts together a doubles team? I did. So I asked Brookfield East girls tennis coach Linda Lied. Lied’s team has been to Team State six times, including the last four in a row. Four girls also made it to Individual State this season - Emily Horneffer (who was featured in Preps2Pros.net last fall) and Allison Brankle made it in singles, Brankle as a special qualifier. But this feature is about the doubles team who also qualified with Horneffer - Maria Korkos and Julia Vitale - two girls as different as you can get, but who worked well together on the tennis court. Neither Korkos nor Vitale played on the varsity as freshman, in fact. Vitale wasn't even on the tennis team, as she was in the Spartans volleyball program. Korkos, a senior, played three seasons on the varsity, getting promoted her sophomore year. She went to state three times in her career as part of the East doubles team, with three different partners. She initially qualified for state as a sophomore with Sabrina Zhong, going 1-1 after finishing the year with a 17-7 record. "As the year rolled around, they kept getting better," Lied said about Maria's sophomore year. "A lot of it was due to her. Sabrina was real quiet and Maria is the opposite of that. Maria would say 'We are not going to lose this.' and Sabrina would play up to the level with her. They were a great little doubles team and they did very well. When we put them on the court, we knew they were going to win." Then as a junior she teamed with Carly Wolff, went 1-1 at state and finished the year with a 10-3 record. This season she teamed with Vitale, lost in the first round at state - 6-2,7-6(4) - and finished with a 14-8 record. They each took a different road to get where they are today. 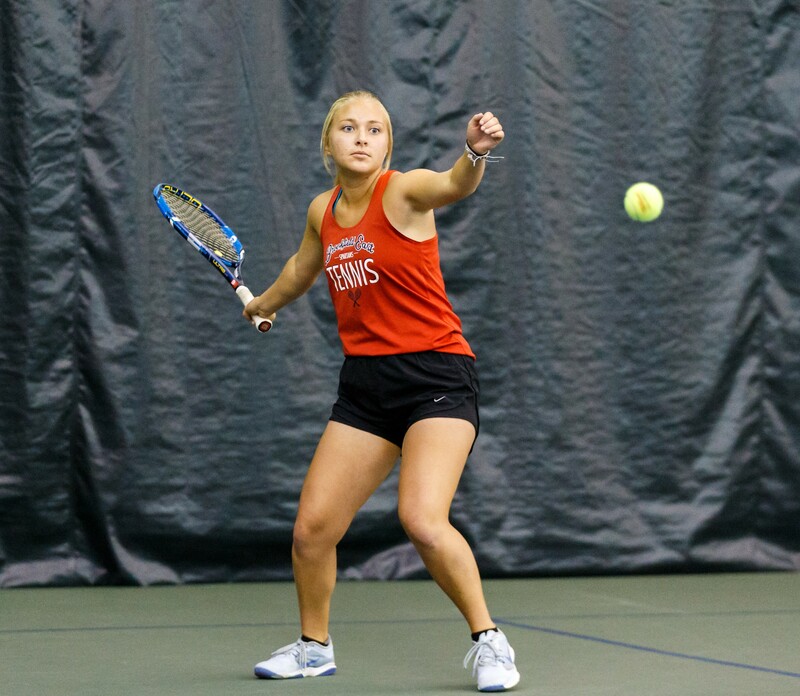 Korkos, one of three varsity captains along with Brankle and Horneffer, started out as a youngster, playing at the Western Racquet Club right up until high school. "I knew Maria since she was little since we were members of the Western Racquet Club," Lied said. "She came to my camp as a 7th or 8th grader and I got to see her play. Her freshman year I had her on JV, but I did call her up for one match to play singles at the time. I knew she was real tenacious, feisty, liking to win. I wanted to get a chance to see her. "We laughed about that first match. She had a great first set then she became complacent. The girl kept some balls back and Maria was mad at her. And she said I just want to be done. I said no, you are done when you win this match. She won that match and she's been winning ever since." That desire to win is what got Maria turned on to tennis. "I definitely have a competitive edge to me," she said. "Especially when I got into high school. I want to win and that got me going. I'm definitely the most hyped person on the team. I get really excited for matches, being able to accomplish my goals. "My accomplishments, my winnings motivated me to keep playing. When I got to varsity, coach put me right into doubles and the strategy of it intrigued me. Singles has a lot of power and I don't necessarily have power, while doubles is played at the net. So I liked the switch." Vitale, on the other hand, also started young, playing on the Elm Grove courts. "I started when I was a little toddler, I used to play with my dad (Steve)," Julia said. "Then I played in some of the Elm Grove tennis programs. My dad always won, but now it might be more neck and neck." 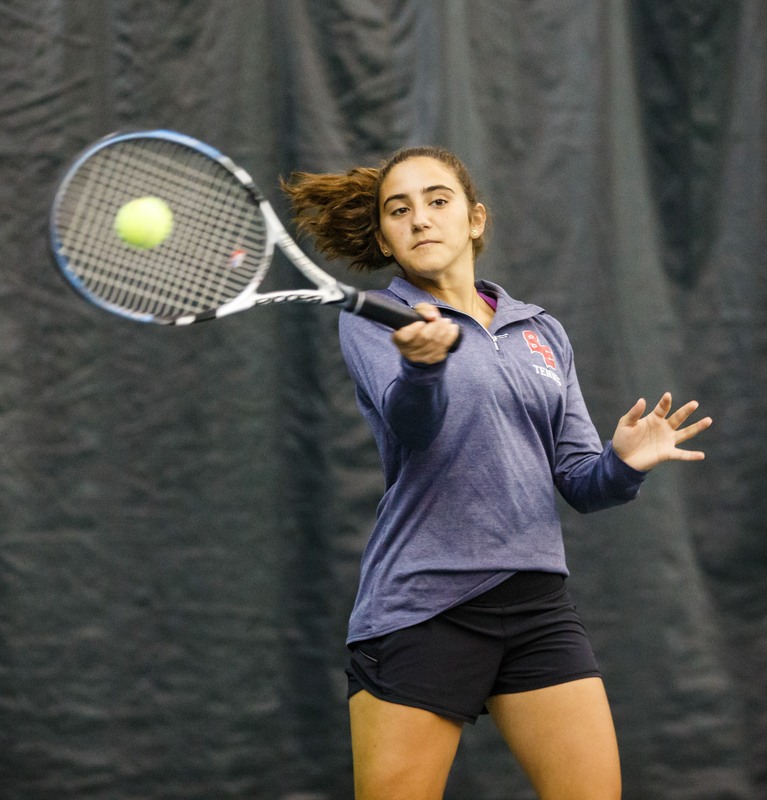 Photo by Alan Herzberg, SportsPhotos LLC --- Senior Maria Korkos has been to the individual state tournament three years years in a row with three different partners. Julia, who also plays the outfield for the Spartans softball team, played volleyball as a freshman, but got cut her sophomore season. "When I got cut from volleyball my sophomore year I went to tennis and just kept going with it," she said. "It seemed to fit better than anything else." So Vitale was pretty much a mystery to Lied when she showed up. "Julia came out her sophomore year after being cut from volleyball," Lied recalled. "What we do, when they come in off of volleyball, we just presume they are not a tennis player and put them on our JV Blue (No. 2 JV team behind JV Red). The coach called me and said Julia can't be on JV Blue, she's too good. I said 'Great, we'll send her up to Red.' The 'Red' coach was very high on her. "When she came out this year for tennis I was immediately impressed with her. So really she came to my attention this year. It was a great jump up for her from Red up to varsity. Every day at practice she kept doing things I was hoping for No. 1 doubles to do." The player Lied was hoping to team up with Maria at No. 1 just wasn't clicking, she was intimidated by it, so her next best player was Julia." Lied then talked about what made Maria and Julia a good doubles team. "For doubles, the first and most important thing is chemistry," she said. "Julia is probably one of the nicest people you will meet in the world. And then you have the little feisty Maria, who has that little 'Greek' in her and wants to win. "The chemistry I was a little concerned about because Maria can be intimidating and I didn't want Julia not to play her best tennis because she was afraid Maria would get mad at her. But that's when Maria's seniority came into play - really she is a nice little girl too. That's when I said you girls have to fit and talk to each other and understand each others' personalities. They need to work well together and I watched them do that. "Maria can get really excited and Julia is not as competitive - her mother (Cathy) says 'I don't have a competitive bone in me and neither does Julia' - but the two of them (Maria/Julia) found a way to become competitive together. They've done some really great things this year. They're getting better, every time they hit the court." Lied then talked about the strategy of playing doubles. "The net is instinct. But you have to know where the ball is going to be," she said. "I find that if I can find some good athletes - Julia is a very good athlete and so is Maria - and put two good athletes in there and teach them what to expect - then they become instinctive and really go after it. When they get confidence, then they really do take charge and they are at the net cutting balls off. "You have to have a plan on the serve and the return. But as far as doubles for anything in tennis it's a really different game. You immediately have to constantly react to your opponent. In tennis all you have is the player on the return and that's just reaction." Both players enjoy playing doubles. "I like team sports and doubles tennis is the closest thing you can get to it," Julia said. "Doubles has different strategy. Doubles is more of a race (to the net), while singles is about I want to try to get this shot." Photo by Alan Herzberg, SportsPhotos LLC --- Junior Julia Vitale, a former volleyball player, and current outfielder on the softball team, teamed with Maria Korkos to qualify for state in her first season on the varsity. Korkos also pointed out the doubles strategy. "You have to know where the other person (opponent) is at all times and where your partner is. We have pretty good hands, so we're both pretty good at the net. We usually end up by the net because we think that is the best way when to end up with points." Korkos is one of three captains, along with Brankle, the other senior, and Horneffer, a junior. "Maria is definitely a 'take-charge' captain. That's her personality," Lied said. "She's the one to scold a fellow player ('Why don't you have your shoes on. Why didn't call us and tell us you were going to be late.'). Maria has always been a take charge person since her sophomore year." Brankle keeps everyone organized and Horneffer observes and waits for her time next year. Lied also talked about Vitale's role next season. "Julia one of only two seniors back. She's a sweet and kind girl. When she takes the court she will be ready to go. But she will be her own type of leader." Lied then talked about both girls off the court. "Julia is just a sweetheart; just genuinely nice. There is not a mean bone in her body. She comes out, willing to work hard. But when her match is over, I'm sure her opponents will tell you she is really nice. Anyone would notice - she is just a sweetheart." And Korkos and Vitale have indeed given the Spartans a sweetheart doubles team this year. WHAT YOU DO TO RELAX: Play violin, hang with friends. MOST MEMORABLE MOMENT: Lost first set to Brookfield Central, but rallied to win the match, including 7-5 in third set this year.